This Fudge Brownie Ice Cream Cake is easy to make and beyond delicious. Two fudge brownie layers, a 3-ingredient chocolate fudge sauce, and lots of creamy ice cream. Death-by-chocolate guaranteed. Yay, a chocolate recipe again! It feels like it’s been ages that I posted a chocolate recipe on my blog. In fact, it was just 16 days ago, but I already had some chocolate withdrawal symptoms. Specifically being annoying. Even Mario was happy that I baked something with chocolate again. I have just two addictions in my life, Mario, and chocolate. Being together with my dear hubby and eating chocolate makes me the happiest person in the world. So you know now my what-would-I-take-with-me-on-a-lonely-island list. This Fudge Brownie Ice Cream Cake was my chocolate salvation. 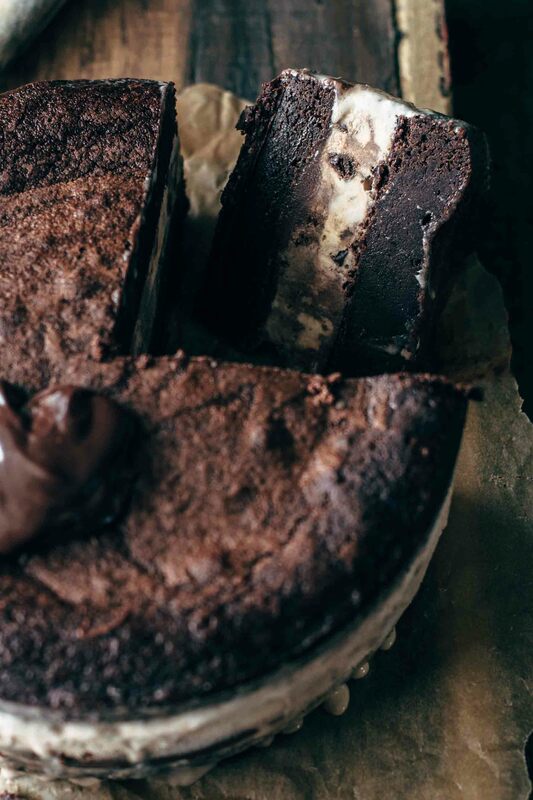 It is extremely fudgy, beyond chocolatey, and super creamy. Doesn’t that three words, fudgy, chocolatey, and creamy, sound like heaven to your ears? For the brownie layers, I made this brownie recipe, doubled the ingredients, and left out the chopped chocolate chunks. I decided to skip the chocolate chunks because the cake is frozen and I made a chocolate fudge sauce for topping instead. But later more on the fudge sauce. Mix ingredients with a whisk by hand and just until combined. Overmixing or using an electric mixer brings too much air into the brownie batter. 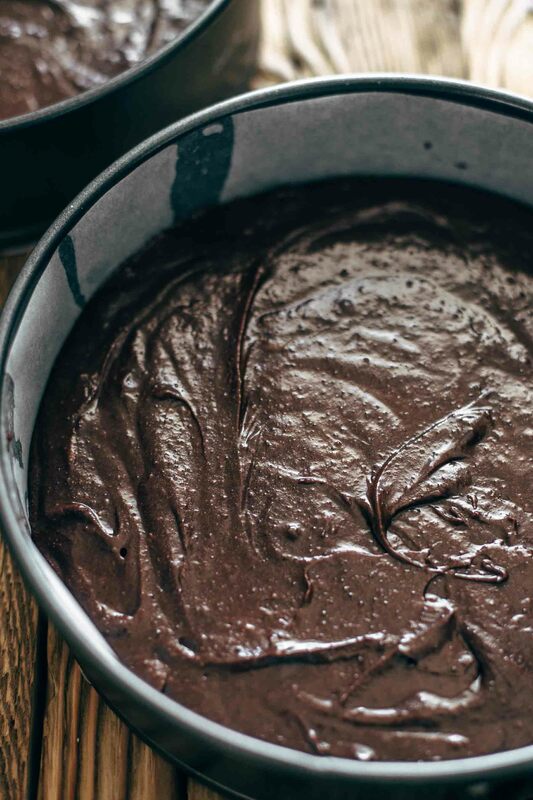 Brownie batter doesn’t need any air at all. It makes the brownies cakey instead of fudgy. Bake until it has no jiggle in the middle and is just set to touch. A toothpick centered in the middle should come out dirty. Overbaking is the most common mistake that leads to cakey brownies. When you bake brownies the first time, then set your timer to 23 minutes and check the consistency. Then check back every 1-2 minutes until they are done. Write down the time and you are set for the next time. Because of opening the oven door a few times you will lose some heat, so write down 1-2 minutes less. Don’t be disappointed when you don’t have perfectly fudgy brownies the very first time. You will see, with some practice you’ll nail it very soon. For the brownie batter, you can use natural cocoa powder or dutch-processed. The dutch-processed cocoa powder is darker in color and is the one I used for my brownies. After baking let the brownie layers cool to room temperature before you fill them with ice cream. 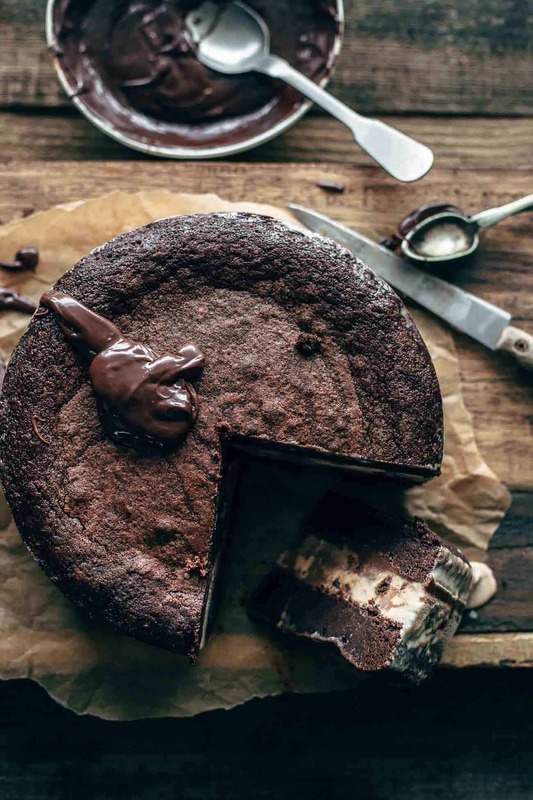 The chocolate fudge sauce, guys, is genius in so many ways. I created this recipe accidentally after an unsuccessful try of making a chocolate ganache. I put chopped dark chocolate and heavy cream into a bowl and heated it up in the microwave. Normally I heat up heavy cream and pour it over finely chopped chocolate and stir until it is melted. But on this day it was already super late, and I stood the whole day in the kitchen and didn’t really think about what I do anymore. So I put both into the microwave and heated it up. The consistency was a mess and didn’t combine very well. Then I thought, ok, I’ll probably have to throw it away anyway, so I try something different first. I took sweetened condensed milk because I read anywhere that this can be used in chocolate ganache as well. I added it little by little and heated it up again. The ingredients were combining, and it really looked good, but the consistency was far away from a chocolate ganache. It looked like chocolate fudge sauce, and it tasted exactly like this. Since this day, I do my chocolate fudge sauce on my own. It is perfect for desserts and ice cream cakes. 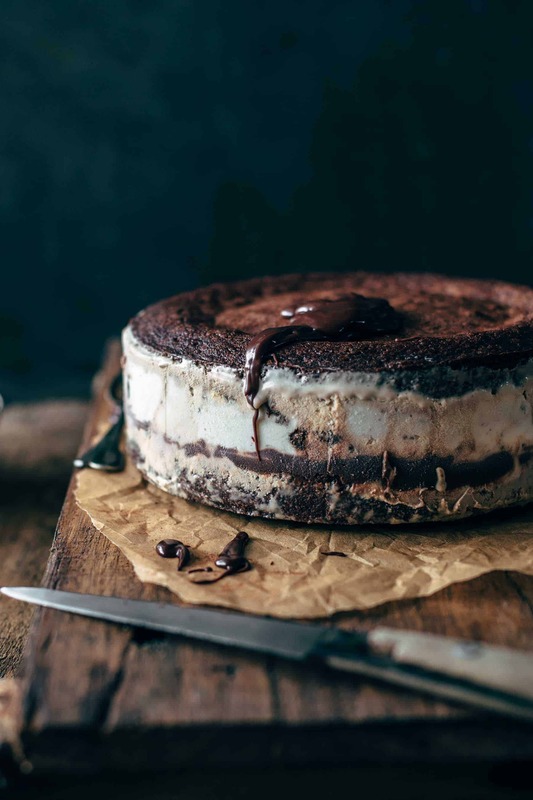 You can drizzle it warm over ice cream, or you can freeze it as a part of an ice cream cake without getting hard. I also used it for this Peanut Butter S’mores Ice Cream Cake as a topping. You can store it in the fridge up to a week. 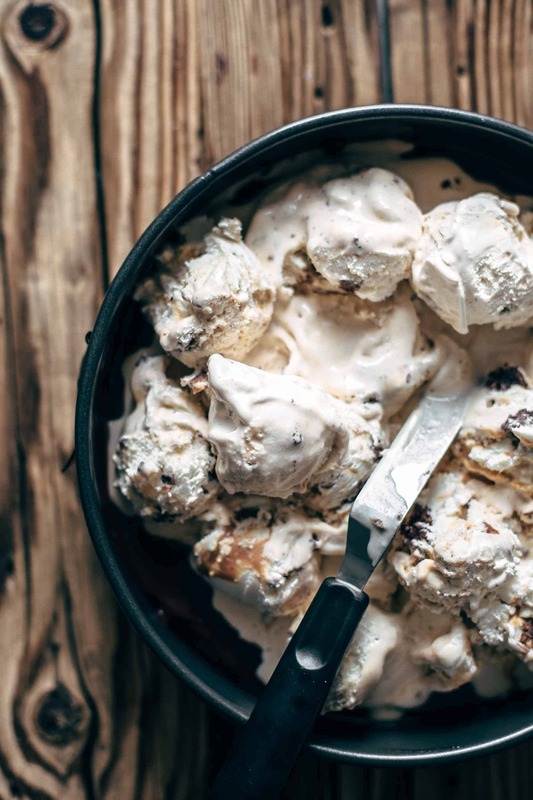 Before drizzling it over ice cream, microwave it a few seconds. The Fudge Brownie Ice Cream Cake. Ok, we have now two thick layers of ultra fudgy brownies and an easy homemade 3-ingredient chocolate fudge sauce. There is just one more thing missing. Lay one brownie layer into the bottom of a 9“ springform pan. Then spread the half of the chocolate fudge sauce all over it. Then fill up with 3-4 pints of ice cream. I filled it almost as high as the pan is as you can see in the video. Use the brand and flavor you love the most or mix different flavors up. My absolute number one favorite storebought ice cream brand is Ben&Jerry’s. For this Fudge Brownie Ice Cream Cake recipe, I used about 3 pints of Ben&Jerry’s ice cream. I mixed up Karamel Sutra Core, Salted Caramel Core, and Chocolate Fudge Brownie. Does that make sense to put Chocolate Fudge Brownie ice cream between two layers of chocolate fudge brownies and chocolate fudge sauce? Well, it does for me. It is chocolate-fudge-tastic. 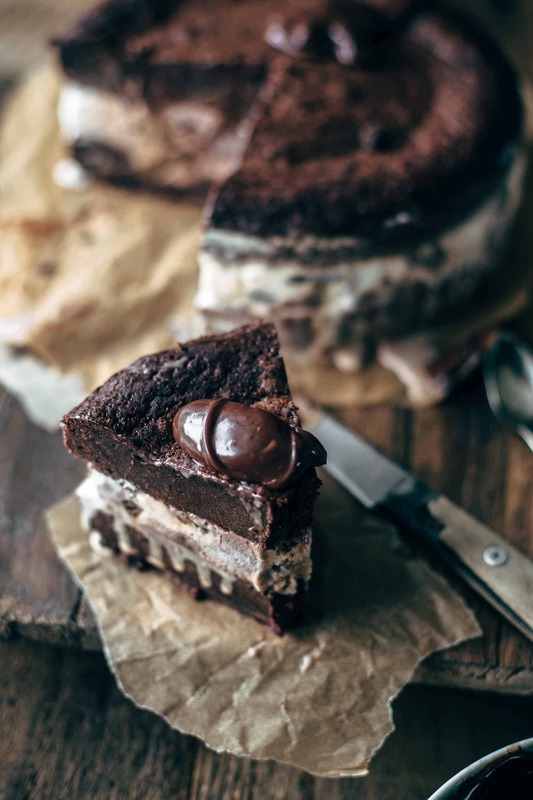 Although this cake is a chocolate lovers dream, maybe you start with a small slice because it is an extremely chocolate overload. Death-by-chocolate, you know what I mean? 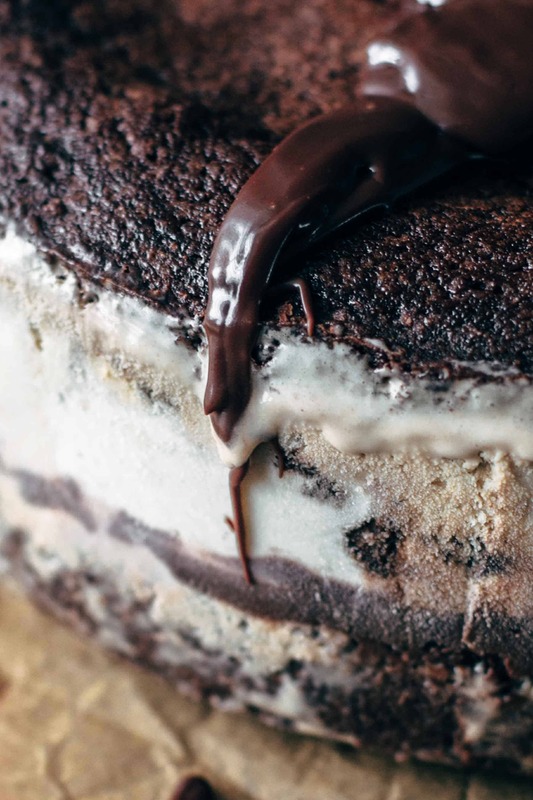 When you take a slice of this Fudge Brownie Ice Cream Cake, drizzle it with warm chocolate fudge sauce. Killer! To come back to this lonely island thing. What would you take with you on a lonely island? 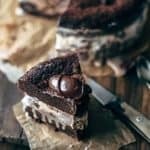 If you make this Fudge Brownie Ice Cream Cake recipe, leave a comment, rate it and tag a photo #alsothecrumbsplease on Instagram! Would love to see your snap! Preheat oven to 350°F / 175°C. Line two 9" (23cm) springform pans with parchment paper. Set aside. Make the fudge brownie layers: In a large mixing bowl stir together butter, sugars, eggs, and vanilla* just until combined. Don't use a hand or stand mixer or you have too much air pockets in the batter, and this makes the brownies cakey instead of fudgy. Stir by hand with a whisk. Sift in cocoa, flour, and salt and stir just until combined. Divide into the two prepared pans equally and bake for 25-30 minutes until the brownies don't jiggle anymore and are just set to touch. A toothpick should come out dirty. Don't overbake the brownies or they are getting cakey. I baked mine for exactly 29 minutes. Read recommendations for the fudgiest brownie layers in the blog post above. Remove from oven and let cool for 10 minutes. They will keep baking in the pan. Then remove from pan and transfer with the baking paper to a wire rack and let cool completely. Make the chocolate fudge sauce: Place chocolate, sweetened condensed milk, and heavy cream in a heat-proof bowl and microwave for about 2 minutes until it has the typical chocolate fudge sauce consistency. Stir every 20 seconds, that the chocolate doesn't get too fast too hot. Assemble the brownie ice cream cake: Place one brownie layer into the bottom of a 9" springform pan. Spread the half of the chocolate fudge sauce all over it. Fill with 3-4 pints of ice cream of your choice and spread evenly. Drizzle with more chocolate fudge sauce if desired. Place the second brownie layer on top. Freeze at least 4 hours or until firm. Cut into thin slices before serving and drizzle with remaining chocolate fudge sauce. Store leftover cake in the freezer up to 1 week. Store leftover fudge sauce in the fridge up to 1 week and warm up in the microwave before serving. 3 pints of ice cream? Oh, Sabine. We are 2 peas from the same pod. I love Phish Food or anything with cookie dough, but this mile-high Fudge Brownie Ice Cream Cake? I’ll take one or a dozen 😉 If you were moving to the east coast, I would say plan a visit to the Vermont Ben & Jerry’s facility, but San Francisco definitely has it’s perks like the Museum of Ice Cream and also these fabulous Ice Cream destinations: https://sf.eater.com/maps/best-ice-cream-san-francisco. From what I hear, people rave about Salt & Straw, Humprhy Slocombe, and Three Twins. Can you tell I love ice cream? I know. I am probably giving you way more information than you need, but I can’t wait for you to start blogging about all of your amazing discoveries here in the states! Oh yes, Amanda! 3 pints at least (: We really love ice cream, don’t we? When I live in the states, I want to see every state. So, I definitely will visit the Vermont Ben & Jerry’s facility one day. Thank you so much for the SF ice cream hot spots. Salt & Straw is the only one I knew and tried and they are really great! I also can’t wait to move and share my discoveries with you! 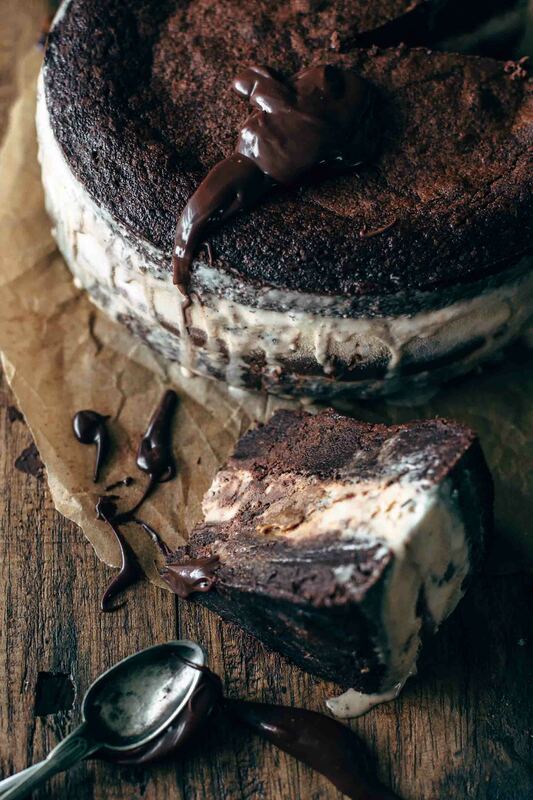 These are two 9-inch brownie layers filled with ice cream. It is one cake about 3 inches high. Hi, this recipe looks amazing! I was just wondering if it is possible to make the cake and leav it in the freezer overnight? I’m thinking if I don’t have the time to make it the same day, Or will the cake taste different? Hi Sara, thank you so much, I’m glad that you like the recipe! You can make the brownies one day ahead. Store them covered at room temperature until you assemble the cake. The fudge sauce can be made 1 week ahead and stored in the fridge. Once the cake is assembled you can easily store it in the freezer for 1 week. Hopefully, that helps! Happy baking!